I'm delighted to share with you the Tommy Nelson Resource book for May! I love that this company works hard to bring us the best books to help us raise our kids for the Lord. It's a pleasure to get to giveaway one of those books every month! I used to attend Vacation Bible School while growing up. I distinctly remember the VBS that was all about the Fruits of the Spirit, and that has stayed with me over the years. Never underestimate what a child will remember in their adult life! 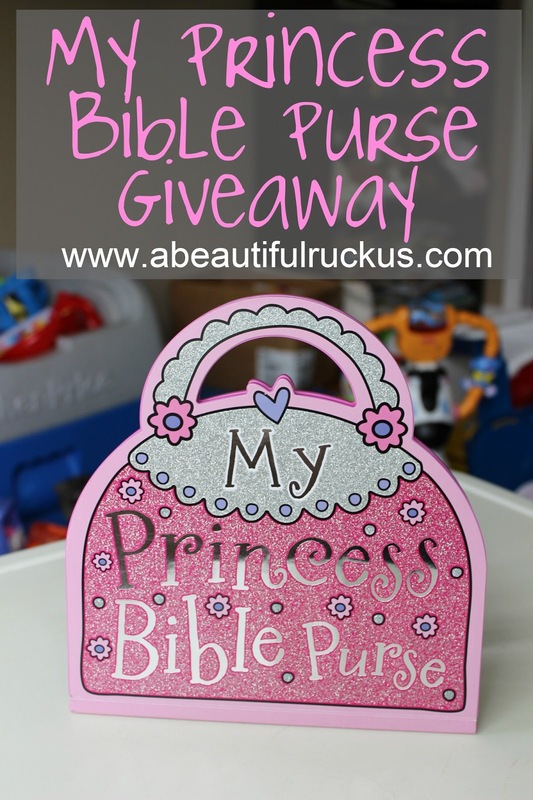 My Princess Bible Purse is a great way to introduce the Fruits of the Spirit to little girls. Each page spread focuses on one of the fruits with a simple rhyme helping kids understand what each fruit means. With the whimsical drawings throughout the book, it's really engaging...even for mom! It's geared for the 2-5 year age range, although I think princesses who are a little older would still enjoy it as well! The book looks just like a bright pink, glittery purse and even has a handle! Each of the pages are made out of a thicker cardstock type of paper to reduce the chances of tearing. 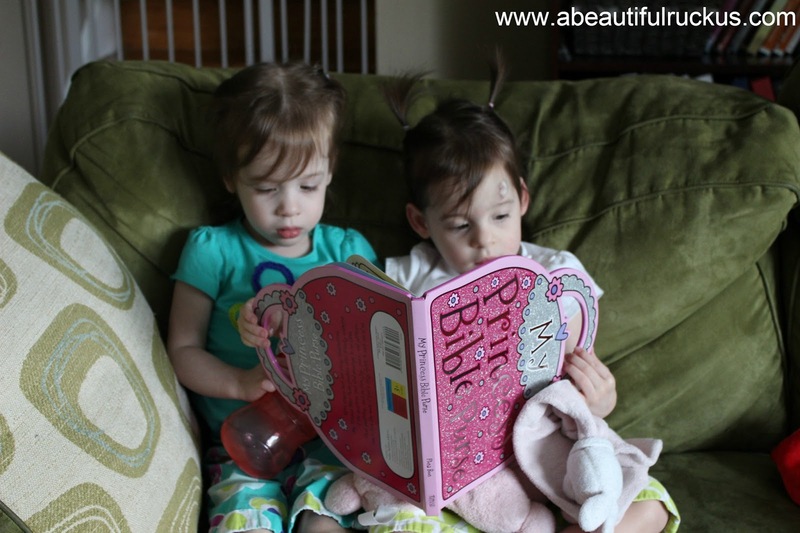 It makes a great transition between board books and paper books while little girls learn to gently turn the pages (we are still working on that here!) If you want a peek inside, feel free to check out this online flipbook! My Princess Bible Purse retails for $9.99 and is available through Tommy Nelson and other retailers. 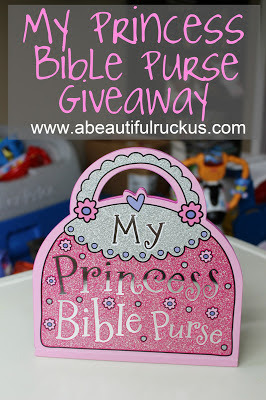 Tommy Nelson is giving one A Beautiful Ruckus reader a copy of the My Princess Bible Purse for a princess in their life. To enter the giveaway, please use the Rafflecopter widget below to enter. The first two tasks are not optional and must be completed to qualify for this giveaway. If you choose the "anonymous option" to comment, please at least include your first name and first letter of your last name. It's impossible to verify comment entries without names! The additional entry tasks are optional. Winning entries will be validated prior to announcing the winner with an alternate drawn if the entries cannot be verified. The contest ends at 11:59pm on Thursday, May 30th. The winner(s) will be randomly chosen and contacted by email on Friday, May 31st. The winner(s) will have 48 hours to respond to the email with their information so that the prize can be forwarded to them. A Beautiful Ruckus is not responsible for the delivery of the prize and is not responsible if the sponsor does not deliver. This giveaway is open to residents of the United States. A Beautiful Ruckus received complimentary item(s) for review in exchange for hosting this giveaway from Tommy Nelson. For more info, please see my disclaimer page. Love, because without love we don't have anything! Ooooo it's hard to pick just one. I want to teach them all but first... Love :) Kayla Rice. Patience...it's something that runs short in our family! My princess needs to be introduced to Patience. Love and patience - I think those two are exactly what my niece needs right now. I think I would have to pick self-control cause that's a hard one. I think all must be taught but Faithfulness is very important. Both spiritually and earthly. Kindness as for me this is one of the most important things for a child or adult to learn. Patience. We need some of that! Patience... I need more of it myself, so it's a good place to start w/my daughter. All of them. To choose one Love. I would say kindness, because every child should be kind to the people that they come in contact with no matter what. Kindness, I believe is taught by example.